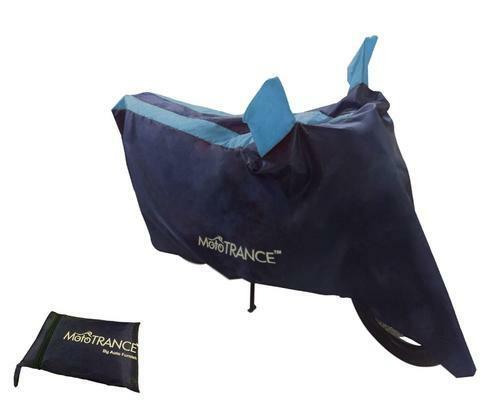 Our firm is well-known in the market as a distributor of Mototrance - Sporty Arc Blue Aqua Bike Body Cover. Incepted in 2011, we “Auto Furnish” are engaged in manufacturing, trading, exporting and supplying qualitative array. Autofurnish is a one stop shop for all car needs. Being a renowned manufacturer and wholesaler , we offer all types of car and bike accessories primarily for auto accessories for all cars and bikes at wholesale rates. Having carved a niche for itself by providing excellent quality products, Autofurnish has spread its wings far and wide across the country. Our USP is our quality, being the manufacturer of Car body cover , seat cover , face mask , Steering Covers , Bike Body Covers , Helmets , air compressors and many more , gives us the upper hand to provide best fitment and high quality products. We also a niche in premium products and customization. We can make body and seat cover of any car or bike whether it’s a sports or vintage or newly launched vehicle we can make it all. In a deliberate attempt to meet the expectations of auto enthusiasts across the country, Autofurnish stocks 50,000 auto accessories at a time. The wide range of quality car accessories offered by Autofurnish comprises of Car Seat Covers, Car Body Covers, Car safety devices, Tyre Care devices, Car interior accessories, Car exterior accessories, Trendy car lights, Bike accessories, Riding Gears, Helmets and many more. We offer the industry's best auto care products at competitively low prices for both Consumers as well as for Professional retailers.